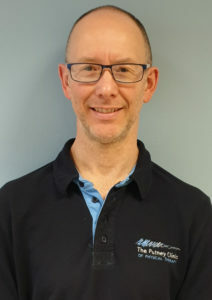 Adrian Dilworth is a Registered Osteopath at The Putney Clinic of Physical Therapy. Adrian has been practising osteopathy for 19 years and has a wealth of knowledge covering a multitude of musculoskeletal problems. He has worked in conjunction with GPs and associated medical practitioners for the majority of his career. In addition, Adrian spent four years teaching osteopathic technique to degree undergraduates. Additional expertise has been obtained in dry needling, foot biomechanics, sports injuries and gastrointestinal issues. Adrian is currently working with a specialist gastroenterologist to help with stomach and bowel disorders. He particularly enjoys helping elderly patients with age related pathologies, especially arthritic conditions. Having a keen interest in golf, football and cycling has enabled Adrian to identify and treat many patients who have injuries relating to these sporting areas. His philosophy of creating and maintaining an efficient musculoskeletal frame is borne through hands-on osteopathic treatment, complemented by exercises, core stability and posture. Book online using the button below.